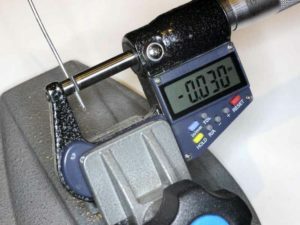 A sample of new unweathered wire was measured to determine the approximate zinc coating depth, it was 15µm. Note that zinc is a sacrificial coating and it will erode through life, so this study is an optimistic one of wire when new. 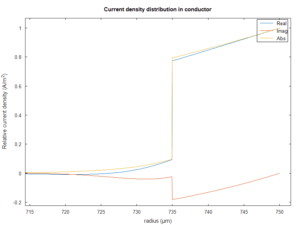 Above is a plot of the current density distribution in the surface region of the wire. Essentially the current flows in the zinc coating and negligible current flows in the steel core. At 15µm, the cladding depth is just a quarter of the skin depth (60µm), so we might expect high effective RF resistance, it is not the zinc so much as that it is very thin. The current distribution allows calculation of the effective RF resistance, it is 805mΩ/m, as against a 1.5mm copper conductor’s 0.106Ω. 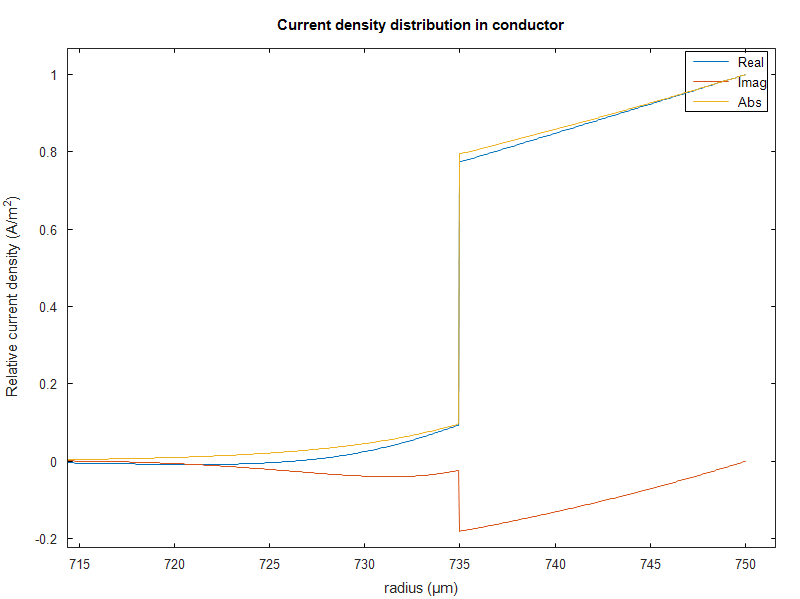 Whilst you might anticipate the conductor loss in a 80m half wave dipole made from 1.5mm copper conductor to be around 3% (0.13dB), the galvanised wire above is likely to be more like 20% (1dB). As mentioned earlier, as the zinc erodes with weathering, resistance goes up. When say half the zinc thickness has eroded, effective RF resistance will roughly double. It is cheap, little risk of the wire being stolen, but it is low efficiency. As a half wave dipole, it would be more efficient on higher bands where the wire length is shorter. We can reasonably assume that a multistrand wire that uses strands thinner than this wire will be worse.